To pursuit a “flexible and dynamic approach to knowledge creation”, Kyoto University launched the “On-site Laboratory” Program with oversea partner universities and research institutions, by establishing locally-managed laboratories for education and research activities. As a first step, Kyoto University in cooperation with Mahidol University (Thailand) will hold an opening symposium. This symposium is connected to Kyoto University by teleconference system. 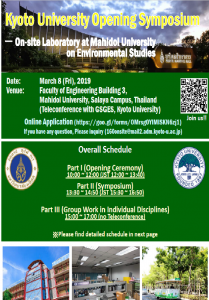 The president of Mahidol University (Prof. Banchong Mahaisavariya) and the Director of Kyoto University (Prof. Nagahiro Minato) will give us addresses about the idea of this program, and its future expectations. Please find details in the following flyer . We welcome faculty/department members, students and young research fellows to join us!